Summary: A rising star in the weightless combat sport of zeroboxing, Carr “the Raptor” Luka dreams of winning the championship title. Recognizing his talent, the Zero Gravity Fighting Association assigns Risha, an ambitious and beautiful Martian colonist, to be his brandhelm––a personal marketing strategist. It isn’t long before she’s made Carr into a popular celebrity and stolen his heart along the way. 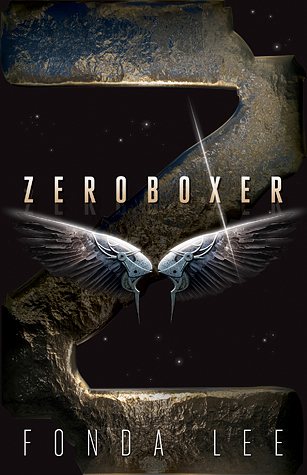 Review: I haven’t been reading much science-fiction lately, but Zeroboxer was a great way to get back into the genre. Fonda Lee has done a great job building a science-fiction world that feels lived in, in both small and large details, from the station Carr lives in to the political tension between Earth and Mars to the regulation of genetic engineering to the fact that Risha is still physically uncomfortable with being on Earth. Of course, nowhere is this worldbuilding more evident than in the titular sport, zeroboxing. While I am not experienced with boxing or any fighting sport, that did not stop me from getting into the book at all. The fight scenes can occasionally be disorienting, but it is easy to keep track of the ebb and flow of the fight. Here, Lee makes excellent use of some classic sports tropes: the underdog, the rival, bad sportsmanship/cheating, etc. Zeroboxer hits most of the right notes in that regard, with difficult moral quandaries along the way. Perhaps Lee’s greatest strength is in her descriptions; sports stories in books can fall flat if the reader is kept too far from the action. Instead, Lee is able to get the reader as close to Carr as possible, not only in the cage, but also outside of it. I was less enthusiastic about how the non-zeroboxing plots came together on Mars and felt that several of the elements were rushed. The ending especially left me torn about whether or not I felt satisfied about it, and there were some social issues Lee touched upon but did not fully explore. For the most part, this didn’t sour my enjoyment of the book, though I do think a little wistfully about what else this book could have done. Recommendation: Get it soon if you enjoy the drama and tropes associated with sports stories, but borrow it someday otherwise. The not-so-distant nature of Zeroboxer allows the reader to explore questions of poverty, corruption, marketing, and more. Lee’s experience with martial arts and her fast-paced writing made for a largely engaging read. A few problems with the last third of the book and uneven character depth in the supporting cast means Zeroboxer probably won’t make my reread list any time soon.